Not having such a good day and wondering how you can start being happy. Here’s a list of ten ways to get happy! You have that one dream that you’re afraid to follow or that you’ve always wanted to do but just haven’t found the courage to actually do it. Well, do it! You only live once and everyone needs to live their dream. Even if it’s something crazy. Follow your heart and do something you’ve always wanted to do for the rest of your life. A new job or traveling the world! Do it! You know what they say, dreaming is believing. Don’t be afraid to take a chance. No matter how bad your day is going or no matter how worse you think it can get just think of the positives. You may not think there are any positives in your certain situation but there’s always positives. You just have to dig a little deeper for them sometimes. If you’re having a bad day at work or school just be thankful you’re alive and that you get to go home to a wonderful family or get to hangout with your amazing friends. Your happiness depends on your attitude. If you’re going to look down on things then you won’t be happy. So take charge and change your attitude, change your outlook on certain things (Which brings me back to thinking positive). Don’t sit around, sulk, and wait for something you want. Take charge, go out and do it yourself. 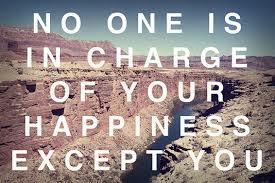 Don’t rely on anyone else for your happiness. 4. Find something that genuinely makes you happy! Whether that’s going on a walk every day or sitting on your front porch looking out at your gorgeous view while sipping on a nice beverage. Indulge yourself in a book. Go hang out with your friends or go on a drive. Anything that puts a smile on your face, do it! 5. Accept the things you can’t change! Some things in life you just can’t change. You have to accept certain things to be happy. You have to realize that you can’t change everything. You also have to realize the difference between the things you can change and the things you can’t change. For the things you can change, change them (Only if you want to). Change is always a good thing. I know this one sounds kinda unusual to fit into this category of happiness but, honestly, how can you be happy with yourself if you don’t know yourself. I know some people are trying to find their way and figure out where their path is leading them. I am one of those people. But to be happy you have to know yourself and know what you thrive for and what you want. Once you know yourself then your happiness will start to evolve. 7. Call someone you love! One phone call can change your mood instantly. Whenever I am having a bad day I would always call my best friend and vent. She would always listen and make it better. Once the conversation ended I was instantly put in a better mood. Calling one person you love can make a difference. Hearing them say they believe in you, or “You can do this”, or even just an “It’s gonna be okay,” is touching and heart warming to know someone loves you. 8. Let go of the people who bring you down! We all have someone we don’t want to let go because we care too much but sometimes letting go of the people who don’t care about you is a relief. Focus on the people who do care and let go of the people who don’t. This has always helped me! Blast your favorite song and get up and dance to it. Sing the song at the top of your lungs and just let go. Last, but not least, have fun! Life is a challenge but there’s always room for having fun with friends and family. Like I said before, You only live once so you need to have fun while you still have the chance. How do you get happier? This entry was posted in Happiness, Uncategorized and tagged accept, dreams, fun, happiness, happy, know yourself, laugh, let go, mile, music, positive, smile, take charge. Bookmark the permalink.